Greater flamingos Phoenicopterus ruber roseus, photographed by Angel Pulido Domínguez. The Phoenicopteriformes include the flamingos (Phoenicopteridae) and their fossil relatives. Flamingos have exceedingly long necks and legs, a distinctively-shaped down-curved bill, and front toes joined by full webs while the hind toe is elevated or absent (Austin 1961). 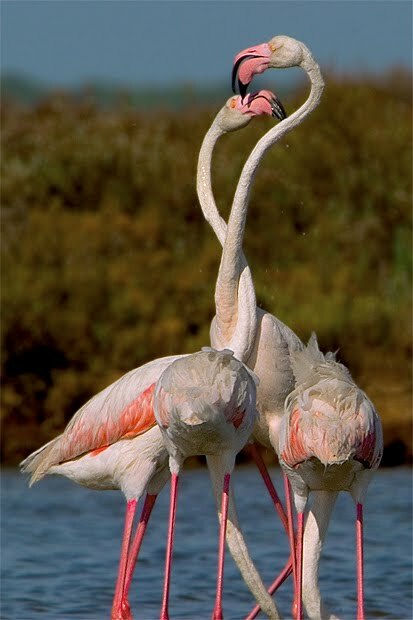 The Oligocene and Miocene Palaelodus is united with the flamingos by its deep mandibular rami, but retained a straight bill (Mayr 2005). Earlier fossil taxa have also been allied to the Phoenicopteriformes, but their relationship is less well supported. [PJ02] Palma, R. L., A. R. Johnson, F. Cezilly, F. Thomas & F. Renard. 2002. Diversity and distribution of feather lice on greater flamingoes (Phoenicopterus ruber roseus) in the Camargue, sothern France. New Zealand Entomologist 25: 87-89.